Not Tonight owes a huge debt to Papers, Please, but finds its own voice in the bit-parts of post-Brexit Britain. What is it? A post-Brexit dystopia meets bouncer sim. They’re all out for the 2-for-1 cider deal at the King’s Head in Exeter tonight, and they brought their fake IDs with them. It’s been a tough shift as a bouncer: fifteen minutes before closing time, I’m down on my quota and one mistake away from a formal warning (they were convincing fakes). I need to get four more people through the doors before closing time to get paid. And I need to get paid so that I can go on living in the country I was born in. Since Albion First formed a coalition government here my Nordic grandparents mean I’m officially a Euro, not a UK citizen. Euros live in designated citizen relocation zones: hovels with European flags in the corridors and xenophobic graffiti in the living room. I was assigned a bouncer job by the authorities, who regularly check up on me. I need to make £2,500 by the end of the month so they’ll let me stay here. If I hit my quota, the night’s work will earn me £80. Not Tonight isn’t shy about making its point, a vision of Brexit Britain taken to extremes. Not Tonight’s specifics are certainly contemporary, but in many ways the song remains the same. We’ve seen games use ID cards and wage labor as the foundation of a social commentary piece before in Papers, Please, and comparisons between Lucas Pope’s 2013 hit and Not Tonight gush out everywhere you look. The mechanical premise is near-identical—checking people’s IDs and refusing or allowing them entry. There’s also the same temptation to operate outside the law, taking bribes here and there or dealing out ‘Cheese’ to hedonistic reggae fans at a festival to earn an extra bit of cash. There’s the personal story too, emerging over time in restrained, drip-fed fashion. It’s unashamedly derivative, but just the same the experience in its entirety feels distinct, atmospherically and politically. Perhaps it’s a reflection on the intervening years’ seismic political events that Not Tonight feels so much more uncomfortable, and releasing as the UK prepares for the possibility of a no-deal Brexit, so prescient. It might seem an obvious point to make but, yes, the enjoyment here hinges completely on your political leanings. Not Tonight isn’t shy about making its point, a vision of Brexit Britain taken to extremes: a nation of haves and have-nots where Europhobic slurs flutter around without anyone raising an eyelid; of people only months ago considered British now facing deportation to countries they’ve never been. However, Not Tonight’s much better at forming engaging, human-led stories on a micro scale than it is at dystopian world-building. The broad strokes feel a bit obvious and the messaging is screamed through a megaphone, but Not Tonight really gains traction in its human interest stories. Take Dave, for example. Dave runs the King’s Head and wears a baseball cap with an England flag design. He’s vocally sympathetic to my character and his plight—“My plumber was a Euro too, good worker. And cheap”—but he’s also very clear in his mind that there’s an ‘us’ and a ‘them’. I’m a decent bouncer for a ‘them’, and our relationship is among the warmest in Not Tonight’s grim world. If I hadn’t performed so well for him during my previous shifts, though, he wouldn’t be so civil. Dave’s a three-dimensional portrait of modern xenophobia who stands as testament to PanicBarn’s writing. He and the other supporting cast of small time drug dealers, fellow Euros with drinking problems, missing husbands, and Brits in morally murky quandaries, are what keep any sense of momentum in a game that would otherwise feel punishingly tedious. After all, is there much intrinsic mechanical satisfaction to be had in checking 25 IDs, one after the next, looking at expiry and birth dates, signs of fakes, photos that don’t match up, and names on a guest list? I confess I find very little. There is, however, satisfaction in having done a good night’s work. Every pub and bar demands a specific quota of entries, with bonus payouts for letting more people in. 15 might be the minimum, 20 earns another £50, and another payout for 25 people through the doors. Hitting those numbers requires stern concentration and an eagle eye—and some luck. You’re not supposed to feel on top of things, but under the state’s kosh. It takes longer to turn someone away than let them in, after all. Many drunken revellers demand a second examination of their cards, and a proportion of those slip some cash over while they do it. It’s up to you whether to take these bribes or not—they might double your evening’s earnings, but everyone you let in without valid identification counts against your social credit rating, and your relationship with the pub. There are much bigger decisions to chin-stroke over, too, some having an enormous bearing on the conclusion. A great big tick for player agency then, although the consequences of your actions are frequently murky. You’re not supposed to feel on top of things, but under the state’s boot, just scraping by, and adjusting your actions accordingly. Does it work as social satire? 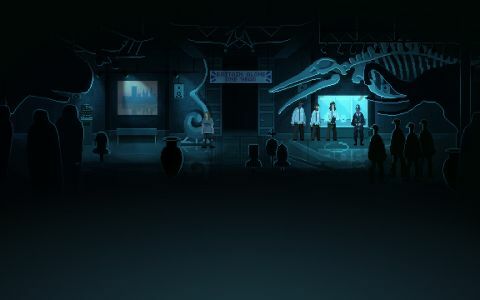 Carding people at nightclub doors isn’t the hand-in-glove fit for Brexit Britain that border control work is in Papers, Please, but Not Tonight does build a certain atmosphere with its pixel gloom, its babbled voices, and its 16-bit graffiti scrawls. The message sledgehammers its way through, but it’s the smaller stories that really permeate and I can’t help but wonder if a more enigmatic, less expository setup might have resonated louder.